EPKK Kraków X v2 has been released. Seattle City XP and Seattle Airports XP were released. Polish Airports vol.3 X (version 4) has been released. Polish Airports vol.1 XP (version 2) has been released. Seattle City X and Seattle Airports X were updated to version 1.1. EPWA Warsaw Chopin Airport XP V2 has been released. EETN Tallinn v2 XP has been released. 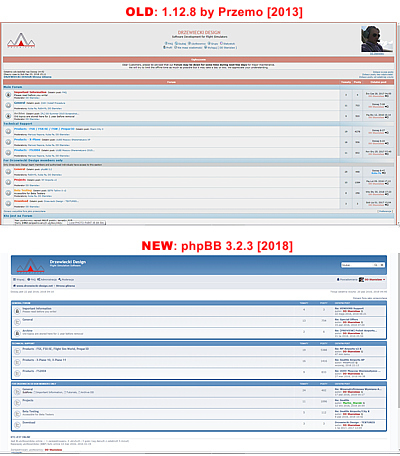 Our Forum received a major upgrade to the newest phpBB version. This will ensure highest security and best performance and efficiency. This was a very complicated task performed by a very skilled specialist. NY Airports v2 XP (in two parts) released. EETN Tallinn v2 X has been released. Seattle City X and Seattle Airports X were released. NY Airports v2 X (in two parts) released. Most of our products were updated to become compatible with Prepar3D v4. Washington XP and Polish Airports vol.2 XP (version 2) were released. Washington X has been released. All our X-Plane 10 products have been updated to become also compatible with X-Plane 11. Polish Airports vol.2 X (version 4) has been released. Moscow City XP has been released. Polish Airports vol.1 2017 and Polish Airports vol.1 X (version 4) were released. Moscow City X has been released. Baku XP has been released. Baku 2017 has been released. Baku X has been released as well as Drzewiecki Design Grass v2. LUKK Chisinau 2016 and LUKK Chisinau XP were released. LUKK Chisinau X has been released. New York City XP has been released. New York City X (v2.0) has been released. EPWA Warsaw Chopin Airport XP has been released. Warsaw City X (v1.5) has been released. EPWA Warsaw Chopin Airport 2015 has been released. Warsaw City 2015 (v1.5) has been released. EPWA Warsaw Chopin Airport X has been released. Miami City X has been updated and is now available for Prepar3D v2. Warsaw City XP is now available. Miami City XP is now available. Our website has been upgraded with an interactive slideshow and a drop-down menu providing easier navigation. Polish Airports vol.1 XP is now available. Polish Airports vol.2 XP is now available. Polish Airports vol.3 XP is now available. New York Airports XP is now available. UUEE Moscow Sheremetyevo XP is now available. EETN Tallinn XP , our first product for X-Plane 10 is now available. UUEE Moscow Sheremetyevo 2015 is now available. UUEE Moscow Sheremetyevo X is now available. EETN Tallinn X is now available. EETN Tallinn 2014 (for FS2004) has been released. New York Airports X has been released. Polish Airports vol.1 for FS2004 (v3) has been released. Polish Airports vol.1 X (v3) has been released for FSX and Prepar3D. New York City X has been released for FSX and Prepar3D. Warsaw City 2013 X has been released for FSX and Prepar3D. Warsaw City 2013 has been released for FS2004. FSX version is expected do be completed in the beginning of December. Polish Airports vol.3 package has been released for FSX and Prepar3D. All our other FSX sceneries are now compatible with Lockheed Martin's Prepar3D as well! Miami City 2012 X has been released for FSX. The FS2004 version is also available. Our website has been upgraded to look more fresh, clear and modern. We hope you are going to like these changes. Now it will be easier to navigate through the website. Polish Airports vol.3 is now available for FS2004. FSX version is expected do be completed in August. Miami City 2012 is now available for FS2004. FSX version is expected do be completed in June. EPKK Kraków Balice 2012 X for FSX is now available. Both FS9 and FSX versions will be supported by AES. EPKK Kraków Balice 2012 for FS2004 is now available. Bornholm Island 2011 for FSX is now available. Both FS2004 and FSX versions are supported by Aerosoft's AES v2.12 and higher. The continuation of the static aircraft series, 50 Static Aircraft vol.2, is now available. Our first foreign scenery - Bornholm Island 2011 for FS2004 - is now available. The Polish Airports vol.2 for FSX is available. The Polish Airports vol.2 for FS2004 version 2.0 is available. It features some minor bugs fixed and a redesigned EPLL airport (with the new terminal). A new website section is launched: Shop. It presents all stores where you can easily find our commercial products. The Polish Airports vol.1 for FSX version 2.0 and the Polish Airports vol.1 for FS2004 version 2.0 scenery packages are now available at Simmarket and other stores and are free for those who purchased version 1. This is not an update! You need to remove the previous version completely. Version 2.0 corrects all bugs from version 1 and adds many details to each airport, including static aircraft. It is highly recommended to download version 2.0 in case you have version 1 installed, as the new version also has different AFCAD files and updated charts. The EPGO Góraszka 2010 The Airshow Challenge freeware scenery is now available on our website and other websites with Flight Simulator add-ons. The Polish Airports vol.1 for FSX scenery is now available at Simmarket. The EPMO Modlin X scenery is now available at the Simmarket store. The EPBC Babice X scenery, our first payware release for FSX, is now available at Simmarket store. The Polish Airports vol.1 scenery package (for FS2004) is published, featuring 3 Polish airports: EPRZ, EPKT and EPGD. The second version of EPMO Modlin (for FS2004) scenery has been released. The update is free for those who purchased the first version. 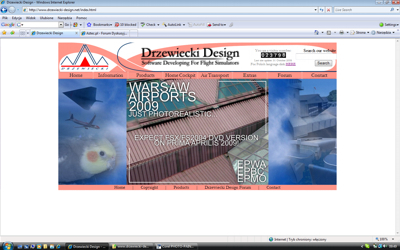 Our second commercial scenery Warsaw Airports 2009: EPBC Babice (for FS2004) has been released. 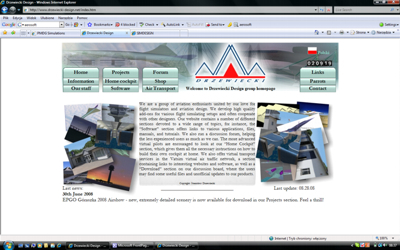 Our virtual airline Drzewiecki Design Air Transport is now cooperating with Aztec Airways. DDAT's website and our aircraft's paint scheme has been updated. Our first commercial scenery Warsaw Airports 2009: EPMO Modlin (for FS2004) is released at Simmarket store. Introducement of our VATSIM event project - World Flight 2009 Extreme Approaches. Drzewiecki Design Home Cockpit System Version 2 is finally finished! 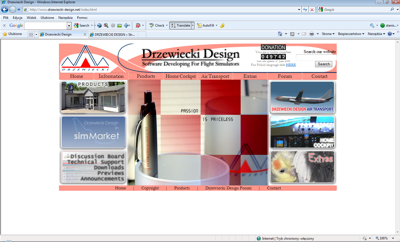 Drzewiecki Design has formally become a company. Welcome to the new, 5th version of our website. We hope you enjoy it! EPGO Góraszka 2008 Airshow - new, extremely detailed scenery is now available for download in our Projects section. The Parrots Gallery is completely rebuilt now and powered by Picassa Web Albums. Have a look at the new version! Góraszka EPGO 2007 is now available for X-plane! The Drzewiecki Design Home Cockpit (version 1) project is finally finished - please check the Home Cockpit section for details. 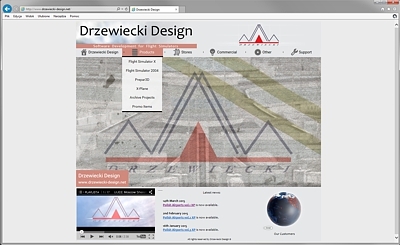 Launch of Drzewiecki Design Air Transport virtual airline and an upgrade of our website. Our first scenery has been published - EPGO Góraszka 2007. We have just uploaded the 3rd version of our homepage and we hope you like it more than the previous one. We have published a new version of our website. Please express your opinion about this change on our forum. Our forum is now fully functional. Registration is required to post a message. We are happy to launch our first website [the link leads to the archived version]. If you have any questions or suggestions, please don't hesitate to contact us. Establishing the Drzewiecki Design brand.